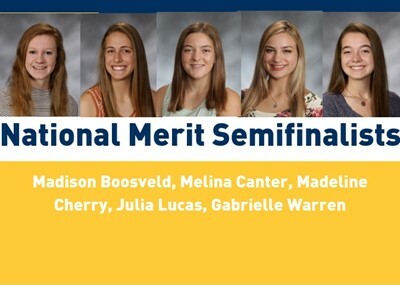 Cincinnati, Ohio, September 12, 2018 – Saint Ursula is proud to recognize the following students named by the National Merit Scholarship Corporation as Semifinalists for 2018-2019. Madison Boosveld of Colerain Twp. Madeline Cherry of Pierce Twp. Julia Lucas of Anderson Twp. The academically talented students finished in the top 1% of more than 1.6-million students nationwide who took that PSAT exam as juniors. They are among 16,000 semifinalists who will have an opportunity to compete next spring for 7,500 Merit Scholarship awards worth more than $32-million. Finalists complete for one of 2,500 National Merit $2,500 scholarships that will be awarded on a state-representational basis. About 1,000 corporate-sponsored Merit Scholarship awards will be provided by approximately 230 corporations and business organizations for Finalists who meet their specific criteria, such as children’s of the grantor’s employees or residents of communities where sponsor plants or offices are located. In addition, about 180 colleges and universities are expected to finance some 4,000 college-sponsored Merit Scholarship awards for Finalists who will attend the sponsor institutions. National Merit Commended Students will be named later in the month.